jodiann570 has no other items for sale. 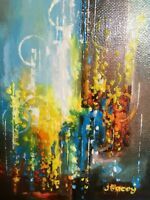 NEW ORIGINAL HAND PAINTED TEXTURED ACRYLIC ABSTRACT PAINTING ON CANVAS. NEW ORIGINAL TEXTURED SMALL LANDSCAPE ABSTRACT ACRYLIC PAINTING ON CANVAS. NEW SMALL BLUE ORIGINAL TEXTURED ACRYLIC ABSTRACT PAINTING ON CANVAS. Nautical Abstract Art 3 Piece acrylic painting on canvas 12" x 36"